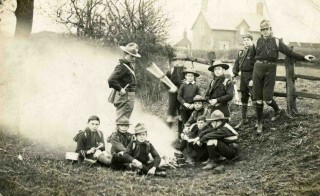 Bottesford Scouts camp fire c 1912. 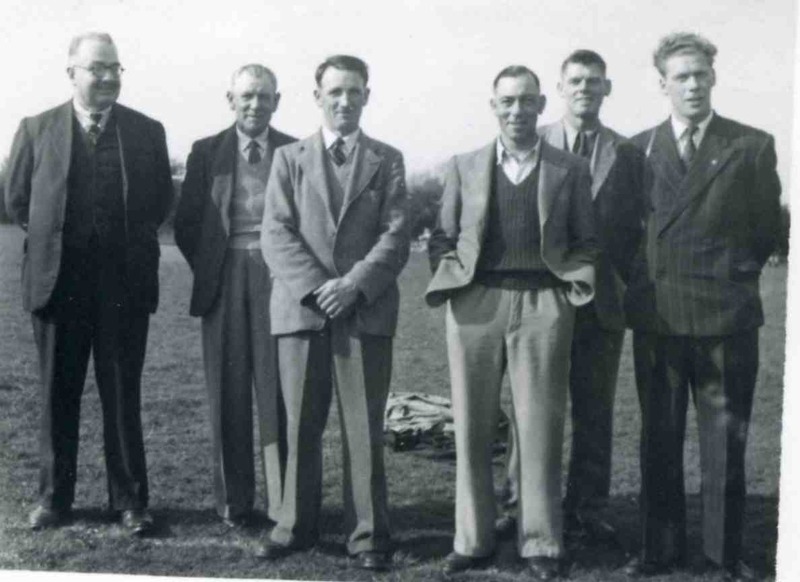 Standing left - Charles Calcraft; seated left of fire, L to R - unknown, Sydney Taylor, Arthur Taylor; standing right of fire L to R - Edgar Culpin?, Bill Cooper, Wilf/Harry? Challands; seated right of fire, L to R - Bob Sutton, Frank Sutton?, unknown; standing rear by fence: unknown, Harry Lane. Letter published by Harry Lane in 1944. Harry William Lane was on the Absentee Voters list of 1918-19, where his home address was Belvoir Road, and he was listed as Private 494230, 86th TRB, though his obituary stated that he served in the RAMC. He was also one of those on the Bottesford ‘church list’ of WW1 Servicemen. Harry William Lane the younger son of Marshall Lane (II) and Anne Lane. He was born on the 25th July, 1897, and baptised on the 29th August in that year, at Dumdum, Bengal. This was probably in St Parick’s church, in the Dumdum Cantonment. This was an important British military centre located just north of Kolkata (Calcutta) in Bengal. It was the home of the British Royal Artillery Armoury and headquarters of the Bengal Artillery. It was here that the “Indian Mutiny” began in 1857. In 1901, he was probably with his parents in India, but in the census of 1911, Harry William Lane was living in Bottesford, a 13 year old school boy who lived at 16 Queen Street, with his elder sister Florence Emily Jane Lane, who was described as the 29 years old housekeeper, born in Hull in 1882. He was an active member of the pre-war Bottesford Boy Scouts Troop, as seen in photographs taken in 1912. Few of Harry Lane’s service records appear to be available. In 1914, he was 17 years of age, and would have been eligible to enlist in 1915 or later (or in 1914 if he had lied about his age). Interestingly, there was indeed a Harry Lane, from near Hinckley in the south of Leicestershire, who joined the South Wales Borderers but was discharged in July 1915, having lied about his age: he was only 16 years 8 months old when he enlisted. However, there is no suggestion that this was the Harry Lane from Bottesford. The “Preamble” by the C.O., 86th TRB is dated 15th March 1918 and so these S.O.’s belong to the “new” 86th TRB, which was created on the 10th July 1917. The “old” 86th TRB as correctly stated did infact become 273rd Graduated Bn on the 4th July 1917. The “new” 86th TRB was then redesignated as a reserve Bn of the MGC and became ‘C’ Bn, MGC, forming part of 1st Training Bde, MGC in September 1918 and it was eventually disbanded on the 6th August 1919(?). By the date of the Absentee Voters list, the 86th was in its later designation, as part of the Machine Gun Corps. It is therefore reasonable to conclude that Harry Lane was in a training battalion attached to the MGC during the latter part of the war. Harry’s Obituary note published by the Grantham Journal in 1968 stated that he had served in the RAMC in both WW1 and WW2. This is difficult to reconcile with the Absentee Voters list. It may be that he was with the RAMC and later, for reasons unknown, transferred to the TRB. There are other records for men called H.W. Lane, but which are unlikely to refer to the man from Bottesford. Among these are a Medal Index Card and Silver War Badge record for a Harry William Lane. The MIC records that he was Private TR/9/33259, 9th Training Reserve Battalion. His Silver War Badge was no.442886, issued on the 23rd August, 1918. The record states that he served overseas, and that he suffered from kidney disease diagnosed as nephritis. It also states that he had enlisted on the 17th November 1914, and had been discharged on the 24th October, 1916, from the 47th Training Reserve Battalion. Few records have been found about Harry Lane’s life after the end of the war. What is clear is that he remained an important supporter of the Scouting movement. His wife was Ena Lane, who was a Guide leader in the 1950s and 60s, and provided details of developments in the 1940s: “One of the original members of the 1st Bottesford Scout Troop, Harry Lane, reformed the Bottesford Scout movement in 1944.” Mrs. Lane noted that “(I)n 1944 Mr H.W. 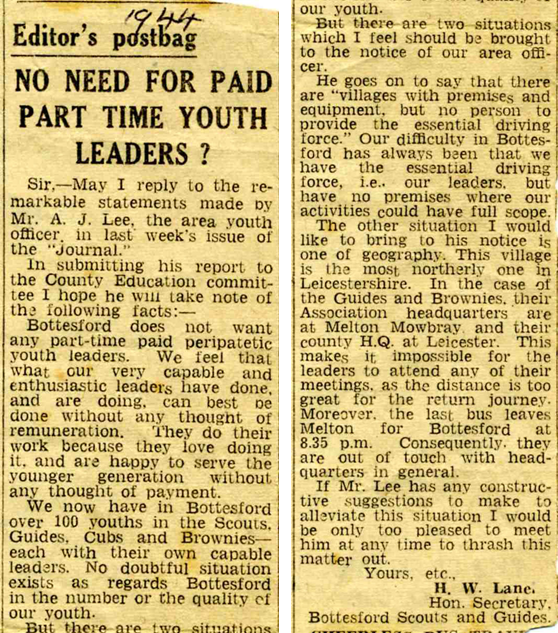 Lane reformed the Bottesford Boy Scouts after leaving the army on 20.10.44. The following boys were enrolled in the Scout movement in St Mary’s Church by Sir Arthur Curtis who was the District Commissioner for Leicestershire – Ken Greasley, Michael Christmas, Clarence Glover, Robin Sutton, John Bugg, Rex Allison, Dennis Grant, Brian Challands, Tom Wright.” Mr. Lane was a very formidable advocate on behalf of young people. Evidently, Harry Lane had a role in the army during WW2, not leaving until October 1944, when he was almost 50 years old. It is possible that he had remained with the army through the interwar years as a part-time Reservist, but this is not confirmed. After leaving the army in 1944, he restarted the Bottesford Scout Troop, and in 1945 enrolled as Group Scoutmaster. He was Treasurer of the Bottesford Scouts in 1950s. 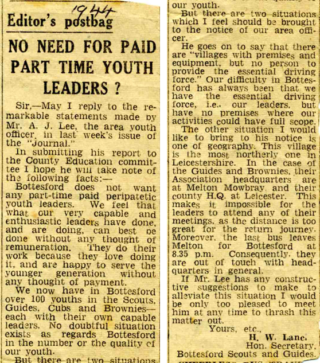 In 1944, he wrote to the Grantham Journal, in support of the Scouts and Guides in Bottesford. Harry Lane died in 1968 and was buried on the 20th June at St Mary’s, Bottesford, aged 70.